Greetings, blogging friends and my other nine or ten readers who drop by occasionally. On Thursday evening I knew I was coming down with something. I was lethargic and didn't feel like going to the Peterborough Petes' home opener. On Friday I went to the office but I was a "zombie". Just ask my colleague David Kennedy. After picking up the kids at school in the afternoon I went home and went straight to bed. On Saturday we had planned on attending a Blue Jays' game but those plans fell by the wayside. By Saturday evening I was suspecting another bout with cellulitis so Carol insisted on taking me to the hospital. I'm glad she did. The doctor verified that it was cellulitis in my head (I had a bout with this last Christmas when I was hospitalized) and gave me some antibiotics intravenously. He let me go home but I was back for more IV on Sunday morning. They have prescribed home care where a nurse comes in every morning for 5 days to change the bag of medication. I carry around my meds which are continually running into my arm intravenously. 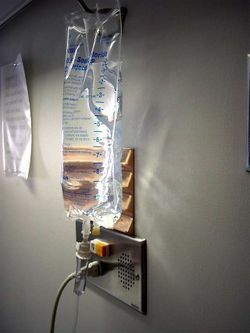 A computerized pump which I carry around in a little pouch constantly sends the fluid into my veins. I've been exhausted for several days now and continue to sleep much of the time. Thanks for your prayers, dear friends! I'll keep you posted on how this "pumped up" blogger is doing. Time for bed again. Sweet dreams! will be praying that you get better soon! Dear David..So sorry to hear that you are ill..It is just NOT the same in the "Fisher Connection" Blogger World without you!! Sorry Carol... One or two more books wont' hurt will it? [one or two more at a time that is!]Ha!! I am breaking up my large collectiom of books and sending them to someone I KNOW will look after them! Sorry to hear that you have been under the weather...we'll keep you in our prayers! Well hey...at least you're gonna get some books out of this...there is never a bad time to add to your library! Take care my friend...keep us posted on how you are doing!